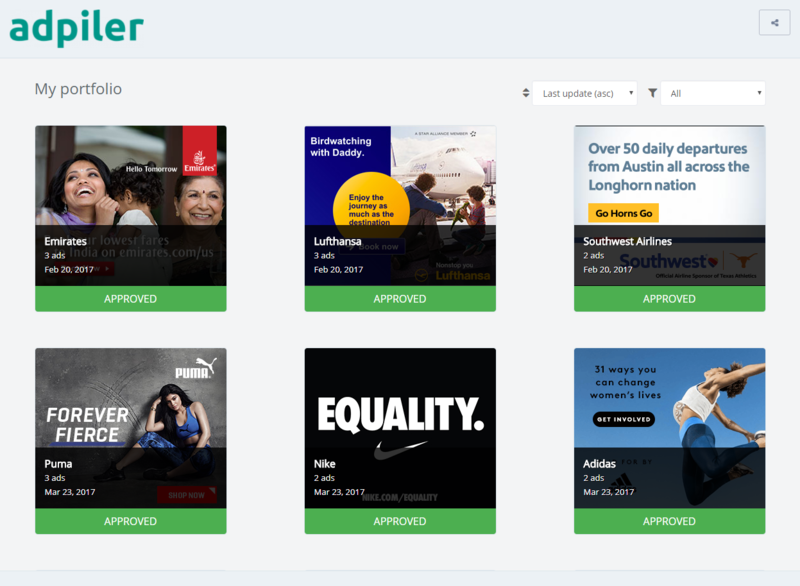 Adpiler is built to preview ads to your existing clients and get their final approval. But did you know you can use Adpiler to convince new clients with your portfolio? Our recently introduced Client preview pages are a great way to showcase your work. How to create a portfolio with your work? Upload the banner work you like to showcase as an ad set to this client. Make sure you disable comments and approval on the preview page, as you don’t want that functionality on your portfolio. Repeat step 2 as many times as you like to upload different banner projects you like to showcase. Have a look at the Client preview page for the client ‘My portfolio’. You will see a great overview of your work, completely white-labelled with your own logo and subdomain, and clients can click through to see all ads in action. Your potential clients will love to see your work. Don’t lose potential customers. Create your portfolio today and share with your leads, social media or link on your website.